We invite you to visit us at our wonderful hidden gem of Jewish resources at the Lila and Joseph Scher Llibrary inside the Jewish Federation's Bronfman Family JCC. Over the past few years, the library has undergone a renovation to make the library a more comfortable and inviting resource for the public. Some 1,200 volumes of fiction and non-fiction are available for both in-library research and circulation. With an emphasis on Jewish tradition and culture, the library strives to present a broad cross-section of works on Jewish art, music, humor, cooking, and holidays, as well as covering basic Judaism, Torah and Talmud, Yiddish, and Hebrew. The biography section includes several collections, like The Jewish 100: from Moses to Leonard Bernstein by Michael Shapiro, while the fiction section includes most of the standards, as well as works by lesser-known authors exploring the Jewish experience. The collection includes extensive sections on the Holocaust, including survivor stories from local residents, and the history of Israel from ancient times through contemporary political issues. One volume not to be missed was published in 1895 by the Palestine Exploration Fund, entitled Thirty Years’ Work in the Holy Land. Also included are videotaped interviews of Portraits of Survival participants (in collaboration with the UCSB Department of Film Studies). It also contains, rare, out of print publications by Roman Vishniac, among other legacy authors tied to the Santa Barbara area. Be sure to check out the book cart sale — overflowing with great books at bargain basement prices! Our gratitude goes to Volunteer Librarian Chris M. Berry for his dedication and expertise keeping our library up-to-date, inviting and interesting. Our library has a Jewish Genealogy section, including a binder of helpful resources. YIVO preserves manuscripts, rare books, and diaries, and other Yiddish sources. The YIVO Library in New York contains over 385,000 volumes dating from as early as the 16th century. The YIVO Archives holds over 24,000,000 documents, photographs, recordings, posters, films, posters, and other artifacts. Together, they comprise the world's largest collection of materials related to the history and culture of Central and East European Jewry and the American Jewish immigrant experience. WorldCat is a union catalog, which itemizes the collections of 71,000 libraries in 112 countries that participate in the Online Computer Library Center (OCLC) global cooperative. It is built and maintained collectively by the participating libraries. Find Jewish communities on campus, scholarships for Jewish students, and advice for dealing with anti-Semitism on campus. 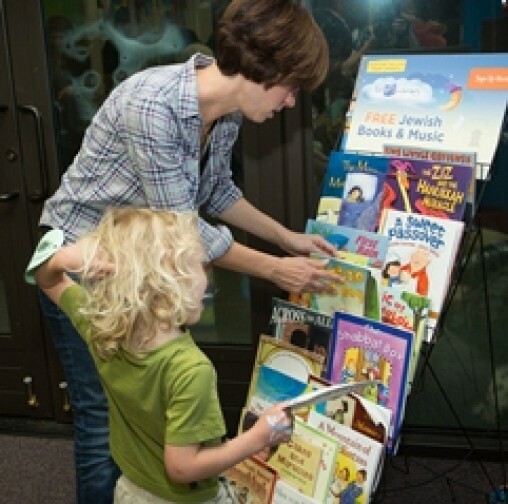 The Federation's Bronfman Family JCC also has a Children’s Library, a brightly colored, warm and welcoming place. Here you can cuddle up and find a Jewish story to read to your children or grandchildren.